Obama And Al Sharpton: An Odd Couple Who Make Political Sense : It's All Politics For the cautious president and the free-wheeling reverend, there's a political symbiosis that comes from sharing the same stage. President Obama and the Rev. Al Sharpton together at the 2011 National Action Network conference. President Obama and Rev. Al Sharpton might at first seem like one of the odder couples in U.S. politics. The president is by nature a super-cautious politician, measured in his rhetoric. He has generally stayed away from overt discussions of race for much of his presidency, though he has spoken more openly and emotionally about issues of race during his second term. Sharpton, on the other hand, built a career as an incendiary racial avenger who for decades was drawn to interracial controversies as if they had some irresistible gravitational force. On Friday, the two men are scheduled to be together when the president delivers a speech to the National Action Network, a civil-rights group Sharpton founded in 1991. Obama spoke previously to the group in 2011. For both men, there's a symbiosis that comes from sharing the same stage. 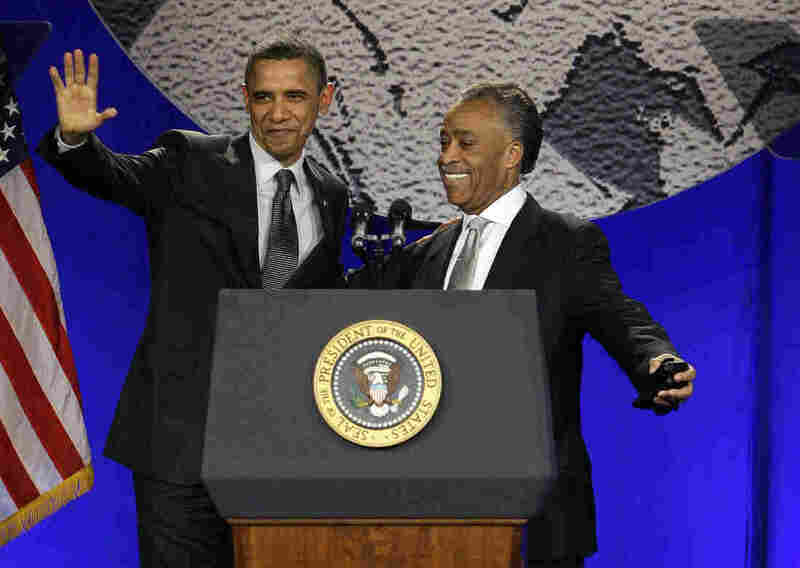 By using Sharpton's platform, Obama can be fairly certain his message will be amplified by the civil-rights leader to the African-American audiences of his nationally syndicated radio show and MSNBC. For Sharpton, it's just another signal of how complete his self-reinvention has been from outside agitator to inside player. "It's a validation of the importance of the organization and its leader," Ben Jealous, former leader of the NAACP, the nation's oldest and largest civil-rights organization, told It's All Politics. "Rev. Sharpton has proven himself the most consistently evolving, populist leader in our country. He has throughout the decades gained the respect and trust of more and more people in our country and has become a figure who more and more people across the spectrum understand has to be reckoned with." The NAACP under Jealous hosted an Obama speech in 2009. Having any president, but particularly the nation's first African American president, speak at a civil rights organization's convention is "an extreme honor and it will be an extreme honor for the reverend and the National Action Network to have President Obama," Marc Morial, the president of the National Urban League and former New Orleans mayor, told It's All Politics. Morial hosted Obama twice when the president has spoken at the Urban League twice. "There's a symbolic importance, that the president has a direct relationship with the nation's civil rights leadership," Morial said. "Number two, there's a substantive importance because it's a chance for him to talk to what, in many respects, are his most loyal followers and constituents about his agenda about the issues he's working on. "Thirdly, it has a historic importance because for many of the people who will be in the audience, it may be the only time in their life that they are in the room and see a president in person, maybe the only time in their life they see President Obama in person. This is part of a very important and necessary outreach." Morial, who plans to attend Obama's NAN speech, suspects the president will deliver an election-year message on the importance of voting, especially for African-Americans who, like several other voter groups, experience dramatic declines in voting during off-year elections. That's an especially crucial message at this stage of Obama's presidency. Obama's only hope of not having his remaining agenda "blockaded" any more than it already is, Morial said, is to keep the Senate in Democratic control. Meanwhile, urging African-Americans and other minority voters to get to the polls this year in the greatest numbers possible can help counter Republican efforts in many states that have made voting more difficult. "We need a strong vote to send a message that we're not going to allow democracy to be frittered away," Morial said. It's not just good politics for the president to attend the convention of Sharpton's group, according to Morial and Jealous. It's also a chance for the president to get back to his roots. "I suspect the president himself being a former organizer probably gets a boost of energy whenever he speaks to any crowd of organizers, be it labor organizers or civil rights organizers," said Jealous.